I have a confession to make. As much as I love my Kindle, part of me is sad that books are going away. By the time I start publishing there is a good chance it will be exclusively as an eBook. So the fact I won't have anything tangible to sign, hand out, or keep on my desk at work makes me wish I hadn't stopped writing for the last decade. As for book Trivia... I'm sure you know this but just in case. The first book produced on the printing press was the Holy Bible. What you might not know: The Gutenberg Bible, as it is known by, was printed in Latin. Only 48 copies have survived the test of time, and of these 48 only 21 are complete. It is known as the most valuable book in the world. It makes me wonder how it was making the first book. 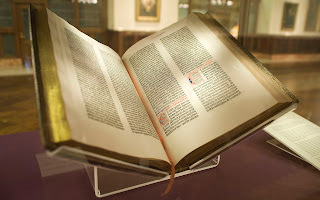 Could Johannes Gutenberg possibly foreseen how prevalent books and printing presses would become or how revolutionary the printing press would be to the world? I'm thinking he had no idea. I also wonder what kind of turnout he had at his book signings. I'm quite sure he could not have fathomed the Kindle that I carry the Bible around on now. Interesting. Thanks for posting those book facts.